SINGAPORE - Building a strong economy with the help of foreign labour while keeping a Singaporean core is 'a tricky balancing act', said Senior Minister of State for Law and Education Indranee Rajah. 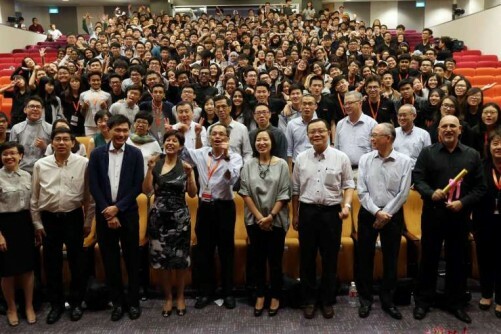 With low total fertility rates and an ageing population looming in the near future, the city-state may have fewer working individuals to drive the economy and support more seniors, Ms Indranee told some 300 students who attended the annual Polytechnic Forum held at Ngee Ann Polytechnic on Friday afternoon. "If you don't have enough of your own people, then you have to ask people from outside to come in," she said. "And that is a very tricky balancing act to do, because you must not have so many people coming in from the outside that your own local, Singaporean core is eroded." She also acknowledged there are sectors that Singaporeans are not keen on working, such as construction. "So that is one area where we will still need to have people from abroad to help out with," she said. Ms Indranee said the Government had been tightening up on foreign labour in the last five years, but it had to be a gradual process. She cited the F&B sector, which faces a lack of waiters and waitresses. "So for us in the Government, we've got to make sure we finely calibrate it," she said. "But as far as possible, wherever Singaporeans can take up those positions, that's what we want." The Polytechnic Forum, which started in 1996, is organised annually by the five polytechnics. It provides a platform for students to gain a deeper understanding of national issues through activities, discussions and dialogue with industry and government leaders. During the two hour-long dialogue on Friday, students from all five polytechnics raised issues such as university education and National Service. A common concern was on permanent residency and citizenship. Ms Indranee noted that foreigners do not automatically qualify to become Singapore permanent residents or citizens. "If we add to the Singaporean pool, (they) must be people who identify with us, share our values and can contribute to Singapore," she said. Urging Singaporeans not to be xenophobic, Ms Indranee added: "We should be willing to allow people to join the Singapore family."